Today’s photo is another from my shoot last Sunday. If I had to title this photo, I might call it “Portrait of Motorcyclists.” As you can see, most of the motorcycle is not included in the frame. This photo is all about Eric and Crystal and their relations to each other and the motorcycle. Motion blur is present, but here I was not trying to make it a primary part of the story. 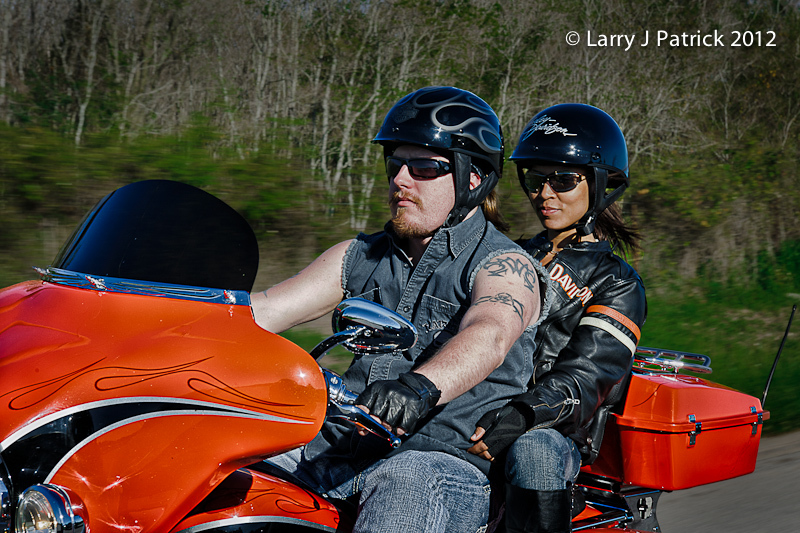 In this photo, I wanted Eric and Crystal to be tack sharp and provide only a hint that the motorcycle was moving. Camera settings: Nikon D3X, Nikon 24-70mm f/2.8 at 70mm, ISO 200, f/13 and with shutter speeds 1/180th of second. Photoshop CS5—used nik Color Efex Pro Detail Extractor and Tonal Contrast to the bring-out details in the subject and did some basic dodging and burning. I like the first shot with more motion blur a bit better, but both shots are outstanding for moving subjects. That's a pretty bold color on the motorcycle. Sorry to miss that photoshoot. Totally different looks at basically the same subject. I can see the first one being a shot for a Harley advertisement and the second being a portrait for Eric and Crystal. You did a good job with both.